The human foot is complex; it has 26 bones, 33 joints, 107 ligaments, and 19 muscles. It is the last point of contact to translate the energy, power, and grace of the human body into upright locomotion. If the foot is injured or misaligned, the efficiency of upright human movement is exponentially decreased. Reports surfaced earlier this week that Rafael dos Anjos broke his left foot during training. Speculation regarding which of the 26 bones he broke wasn't even an option until more information surfaced. The more serious foot injuries include the dreaded Lisfranc injury, or a navicular or cuboid fracture; all of which require surgery in high performance athletes such as RDA. However, after RDA posted a bare and cast-less picture of his foot on Twitter, after his coach stated that he will not require surgery and may return to training in 3 weeks, and finally after his wife added that he fractured his 5th metatarsal; we can safely conclude RDA suffered a Dancer’s Fracture. The 5th metatarsal is the outermost long bone in the foot, and it can fracture anywhere along it’s length but commonly will fracture proximally near its base. 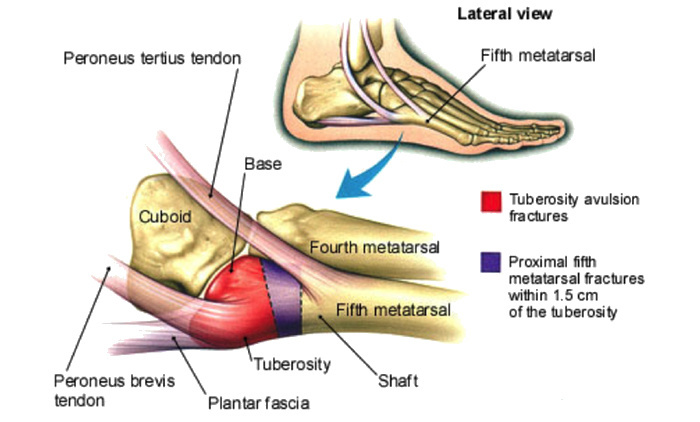 Proximal 5th metatarsal fractures occur in 3 different zones. The Zone 1 Dancer’s Fracture, the Zone 2 Jones Fracture, and the Zone 3 diaphysial/stress fracture. Zone 2 and 3 fractures have a high rate of nonunion (failure of the separate pieces of bone to fuse together) especially in professional athletes with higher than average stress loads and earlier return to training pressures. The reason zone 2 and 3 fractures have a high nonunion rate, and why zone 1 Dancer’s Fractures don’t, has to do with blood supply. Zone 2 and 3 fractures pass right through a relatively avascular watershed area, a region that is supplied by only one short branch of the 5th metatarsal nutrient artery. Zone 2 and 3 fractures can interrupt this blood supply causing it to not heal correctly. The Zone 1, or Dancer’s Fracture, is named because it is commonly seen in ballet dancers. Typically the fracture occurs while the foot is plantar-flexed or pointed, such as when a ballet dancer is on their toes, and then forcefully forced inwards (inversion). The same foot position and force application could have conceivably occurred during RDA’s sparing round kick. When a strong inversion force is applied to a pointed foot either the tendon of the peroneus brevis muscle or the plantar fascia can tear a piece of the 5th metartarsal bone off. All of the metatarsals are major components of the forefoot. They function as a platform for balance and a lever for push-off and explosive movements. With a Dancer’s Fracture RDA certainly would not have been effective in the ring. The blood supply to this area of the 5th metatarsal is robust and thus the risk of nonunion is drastically reduced. Typical management of a Dancer’s Fracture is weight bearing as tolerated (as long as it doesn’t hurt too bad walking, it’s OK) in either a hard soled shoe or walking boot for the first 2-3 weeks. Casting the foot has been shown to increase the length of recovery in Dancer’s Fractures and is not recommended. Crutches aren't necessary in non-professional athletes, but expect an athlete dedicated to his craft such as RDA to be using crutches intermittently to limit his pain and inflammation. Return to normal training can be anywhere from 2-6 weeks based on pain and symptoms, but the process can be delicate and shouldn't be rushed. Returning too early can increase pain symptoms up to 6 months, and while not common nonunion is still a possibility. 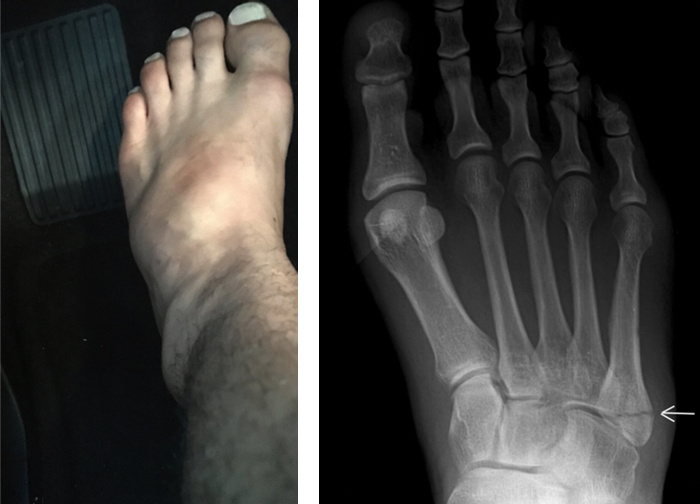 Without Rafael dos Anjos’ actual X-rays, we can't be absolutely 100% certain that he didn't suffer a Zone 2, Zone 3 or distal Metatarsal fracture but thankfully it seems he hasn’t. Based on his recommend conservative non-operative management and early return to training predicted by his coach, RDA shouldn't have any long-term issues.